With compliments to Charles Walsh Nature Tourism who has created an interesting graphic proposal. After you have read this proposal, please don't hesitate to have your say at the bottom of this page in the message forum. I would urge all readers to visit Dee's report "The SBC 'Draft Interpretation Strategy' misses the point." Here dozens more comments can be read on this subject. Comments for above - Bill Denheld Not all pages are represented in this commentary, only pages relevant to SBC. Once fully opened, you will notice there is a comment box on the right panel as shown in image No 1: Project Background - below circled in red. Alternatively please make comment on the Message Forum at the bottom of this webpage. 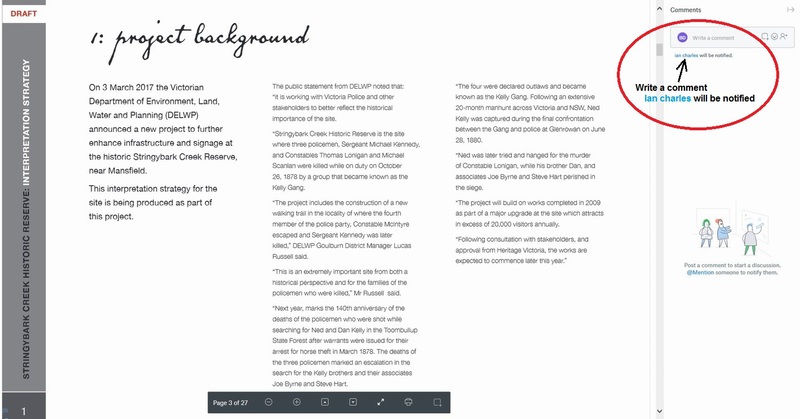 Please note: In the above 'Project Background' first paragraph, "The public Statement from DELWP noted that: "it is working with Victoria Police and other stakeholders to better reflect the historical importance of the site"
So its clear the Victorian Police are behind this proposed upgrade and have briefed DELWP and Heritage Victoria accordingly. It is interesting to note, where in the third paragraph, it clearly states a walking trail will follow the tracks of Const McIntyre and where Srgnt Kennedy was later killed? This is what we want, but these proposed plans have the Kennedy site on the wrong side of the SBC road and west of the creek where, as primary source material tells us, was to the North East of SBC. 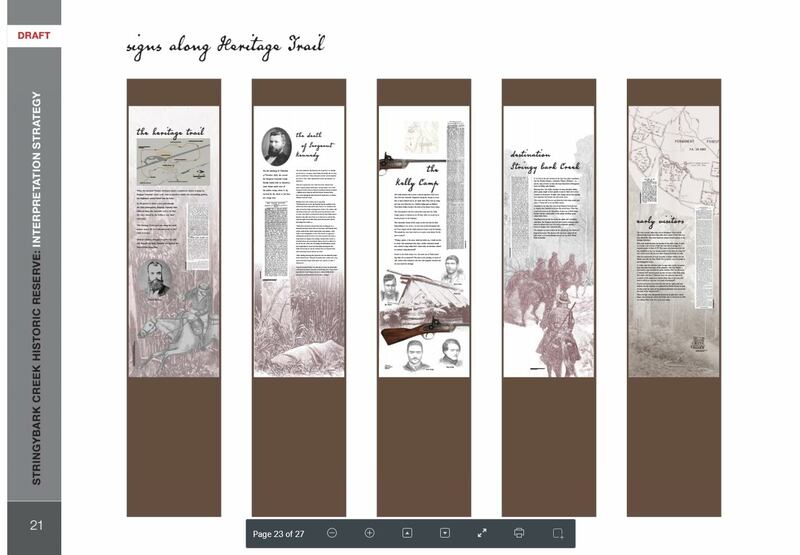 In recent news media, DELWP District manager Lucas Russell said about the trail "this is extremely important from both a historical perspective and for the families of the policemen who were killed" We all agree, but that is not what is proposed here. So lets make sure any trails and signage to be placed are directed as near to the correct site as possible. Previously the SBC history tourist and police descendants visiting these parts have been led up the garden path, and every effort must be taken this does not happen again. If you have an opinion please read all the pages and contact DELWP or this page message forum way below. This particular map above came from one of my early WebPages. I know its my scan from a Kelly history picture book because I drew the faint pencil lines according to scale, and for when I nominated the whole area for Heritage listing as nobody had bothered to do so. I wrote the submission and several years later it was accepted on the heritage register. I was the informant and nominee. The point I will make is that while everyone who has studied my documents past and present, will know that the hut on this particular 1884 map relating to the Police camp was not actually marked on the map where it should have been. In fact the true place is more than 200 metres to the south near the end of the red line page 3, as where the Burman photo was taken. There are the remains of two huts there. So why has this information not been acknowledged for use by Ian Charles ? Fact, Constable Lonigan was shot dead between the seated man and the central stump according to McIntyre who made a drawing and led a party back to the scene. 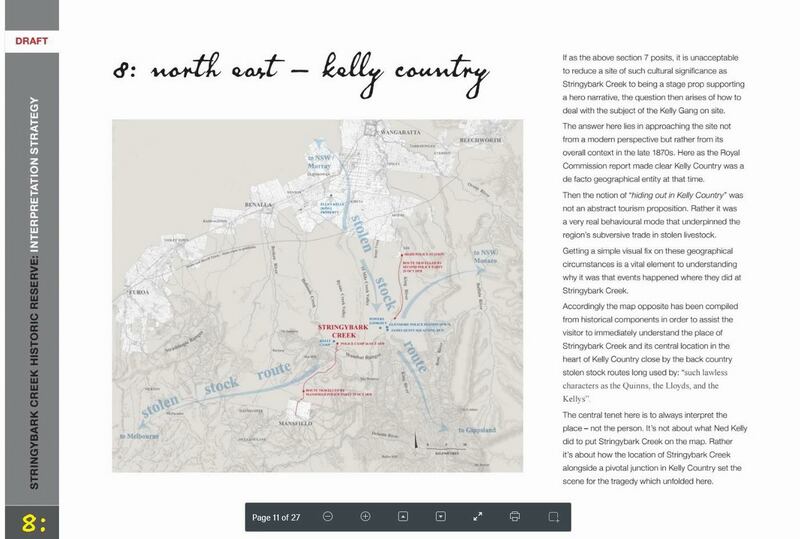 It all seems strange to contract a design brief for SBC to a person who knew nothing about the sites or the Kelly story before he became engaged as from March 2017 (he told me), - and without him ever consulting anyone like me who may be able to assist, or having a committed stake in getting history right. 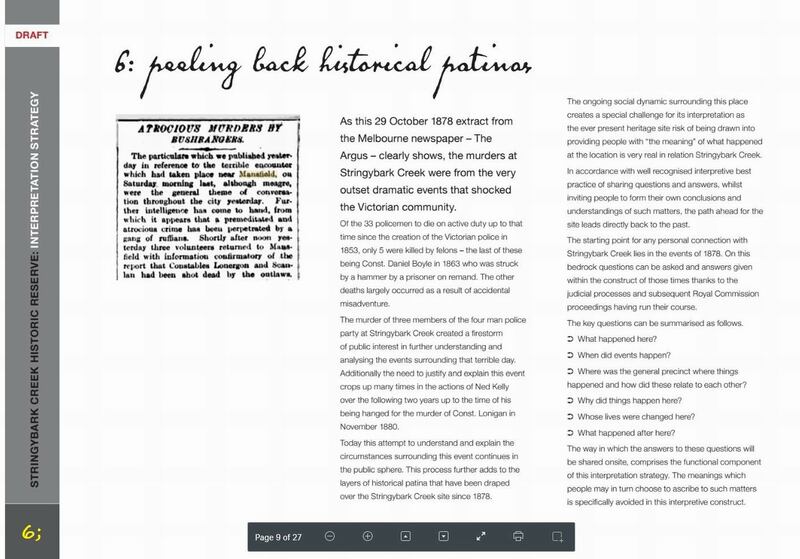 It is obviously intentional, firstly that the Vic Police Historical Unit', in conjunction with Heritage Victoria, and DELWP, engaged Charles Walsh Nature Tourism , which has provided a long-winded historical background which is misleading to some degree. Is there a Stringybark Creek Swindle underway right now?
" My general policy on Stringybark is that we should avoid presenting any parts of the site as definitive locations, -- and -- I think signage at the site, and other site information, can suggest ideas and theories, but should not try to present ideas as facts." So here we can see the type of brief Ian Charles WAS presented with. Does Jeremy Smith think I am some sort of idiot trying to present ideas as facts, it seems like it. Are Ian Charles's hands tied by those who pay for his services? History it seems is a commodity that can be bought if you can get away with it. Where is there any honesty when Jeremy himself said to me by phone that I was, in his opinion ninety five percent correct with my findings, this was witnessed by my wife and daughter a few years back while driving and receiving a call from Jeremy on a hands free speaker phone. I always thought it was Heritage Victoria's role to help protect historical locations, and, also help direct assessment of disputed historical locations, buildings, landmarks etc for Heritage listing, and have known about the SBC two huts location ever since my nominating the sites in 2004 and since then my SBC documentation circa 2010 which was sent to them and is supported by many eminent historians as to where the police had camped at SBC. So why has nothing been done about rejection or acceptance of this site by the authorities? What is their agenda? There is obviously a huge lack of interest because perhaps once burnt twice shy they say regarding the Ian Jones site in preference to the two huts site. So now for them it seems better not to point a signpost anywhere in case they get it wrong again. This is a cop-out if you pardon the pun. This I'm sure the history tourist will not accept. 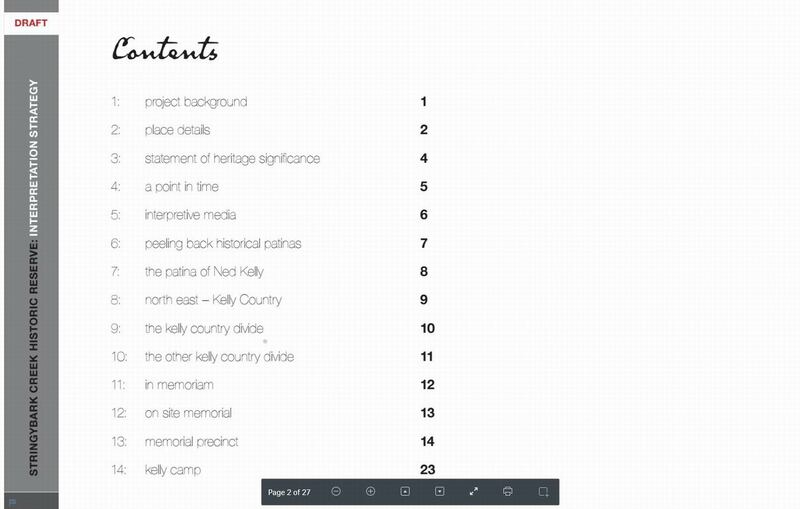 There is no longer any doubt or mystery about where these sites are, and as in the above texts by Ian Charles, see item 3, "The immediate issue to note in this regard is that it is the place itself that underpins its heritage significance." 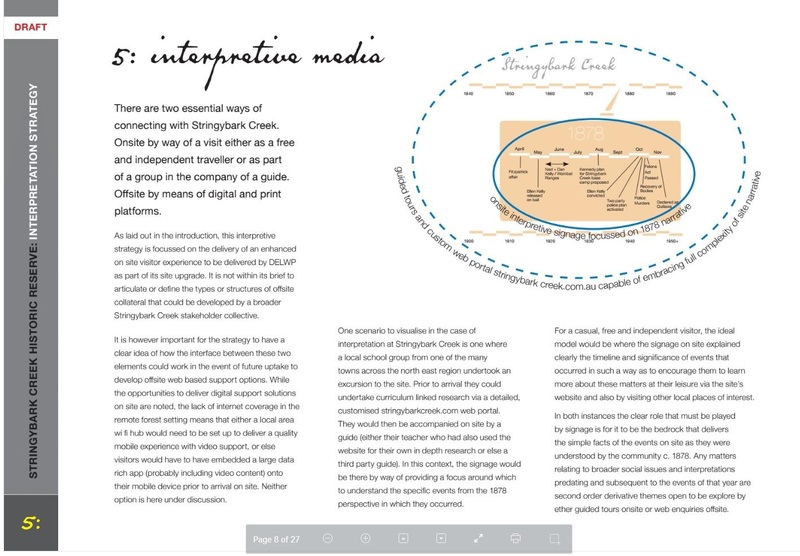 If this is so, then this is not being addressed at all within this proposed interpretive strategy text. 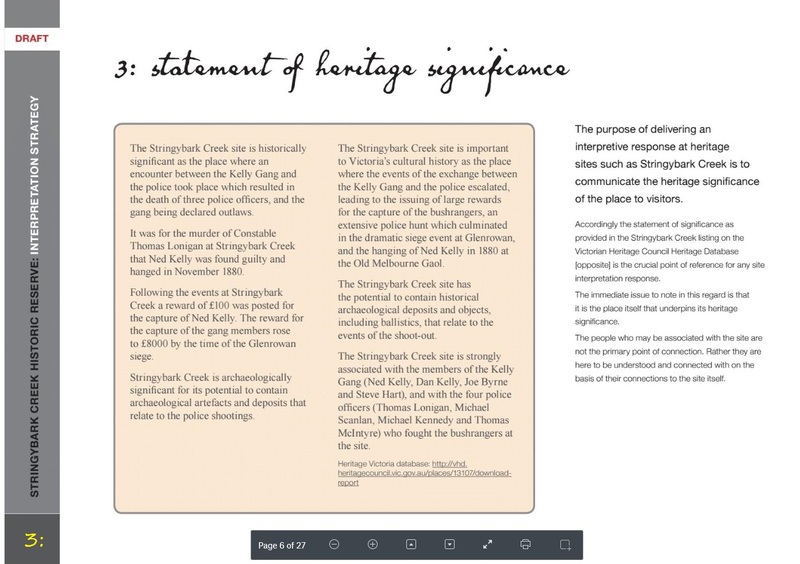 I knew the significance of this when in 2004 I nominated the whole of Stringybark Ck including Kelly camp sites to Heritage Victoria, and wrote the 'statement of Heritage Significance in my submission, and four years later was promised by Heritage Vic archaeology head, Mr Jeremy Smith that archaeology would be undertaken at SBC to prove the sites. To my knowledge this has never happened or been on any serious agenda.
" 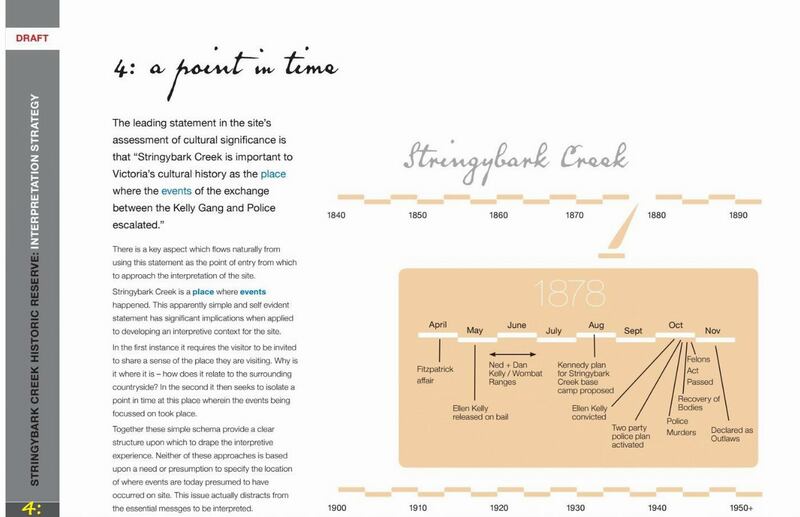 StringyBark Creek is the place where events happened", yes but SBC gully is more than 2 km long. Ian Charles's text reads- 'The visitor is required to be 'invited' to share a 'Sense of Place', Why is it where it is? I ask, why a sense of place as opposed to the 'Actual place' ? Here is a fact, SBC is a Spring. Its waters flow out of from the ground some 50 metres up from the ACTUAL police camp site, and the reason two huts were built there by the original lease holders of Fern Hills Run, Messrs Heaps and Grice who kept sheep there. The huts were shepherds abodes that required a fresh water supply. Twenty years later, the huts were abandoned and re occupied by gold miners who who may have rebuilt them over time, with the fireplaces unlikely to have been moved, but at least one hut was still standing as 'shingle built' that Ned Kelly described in his 1879 letter to the authorities. See: Forth para states, 'simple schema' where there is no "need to specify the location of where events are today presumed to have occurred or took place'. "This issue actually distracts from the essential messages to be interpreted". I say, this is actually absurd. If there is a desire by the authorities to kill off history tourism from the Wombat Ranges, then this is the way to do it.
" What other historical place in the entire world tries to say the exact spot is not that important - we have marked the exact place where the first fleet landed, where Gough Whitlam made his famous speech, where Melbourne was founded, where JFK was shot ( there's an X painted and repainted on the road in Dallas ..) we know exactly where the Broad Arrow cafe was at Port Arthur Tasmania, where ANZAC cove is, where the Glenrowan Inn was, where Harry Lasseter's body was found, where Bourke and Wills 'dig tree camp was, where Bourke died etc..
" Its not within its brief to articulate or define the types of structures of offsite collateral that could be developed by a broader Stringybark Creek stakeholder collective"
Now what does all that mean? And DELWP states Ian Charles was commissioned in an open Tender process? I for one never got to hear about a SBC tender while I am well known to be a graphic and industrial design person capable of any creative account for StringyBark Creek. By this I can see there was a total lack of transparency in this 'Tender process', and had I been notified I would have made a much better proposal. It seems this 'simple schema' setup has a bit of a smell about it, for what ever the reason firstly push historical truth aside, second, give the brief to someone who previously didn't know anything about the Kelly story! Ian told me he was chosen because of his vast expertise in the field and quoted his famous Lake Mungo project in southern NSW. I know a bit about Lake Mungo and have been there several times. The last time I was shocked to see the Simple Schema of how it works there, as now in my opinion the whole place is con job and a waste of time to visit if you are interested in the real Lake Mungo-Man-Lady story. Its about where 40.000 year old skeletal remains were found. The lake is about 12 Km across with a coastline of sand dunes. But what they have done there is a disgrace. On arrival they require a signature and entice the visitors to spend $38 pp to take a tour which leads you away from WHERE the real Mungo items were actually found on the Southern side of the dry lake, yet all tours lead to the northern end of the lake. Ian's explanation was, it was all about a 'sense of place'. Our group were extremely disappointed having committed several days and thousands to get there. As I could see this was a con, we went our own way and even though we were not anywhere near any place of importance, were soon told to leave. At the tourist office there were videos running that I had already seen on TV, so it would appear that the simple schema Ian Charles cooked up for Mungo might make a bit of money for certain administration and official guides, but the real story and real sites is out of bounds there, just like it may end up at SBC if this plan gets the go ahead. This sense of place might work if you are a 'ding dong', but it simply won't wash at StringyBark creek. Comments for 6: Bill This is another page where the real questions are avoided. "What happened here and when ? BUT no WHERE ! I suggest don't worry about peeling back the Historical Patinas, try peeling back the wool being draped over visitors eyes. 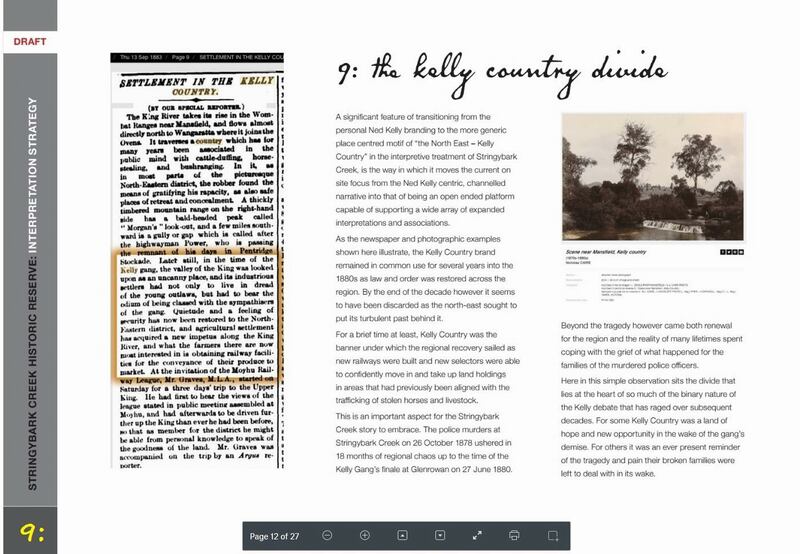 "Kelly experts can be flat out agreeing it is Tuesday, let alone having a consensus on where precisely the Stringybark Creek is- but, in my search for accuracy, I have been every bit as exhausted as I have been exhausted by it. 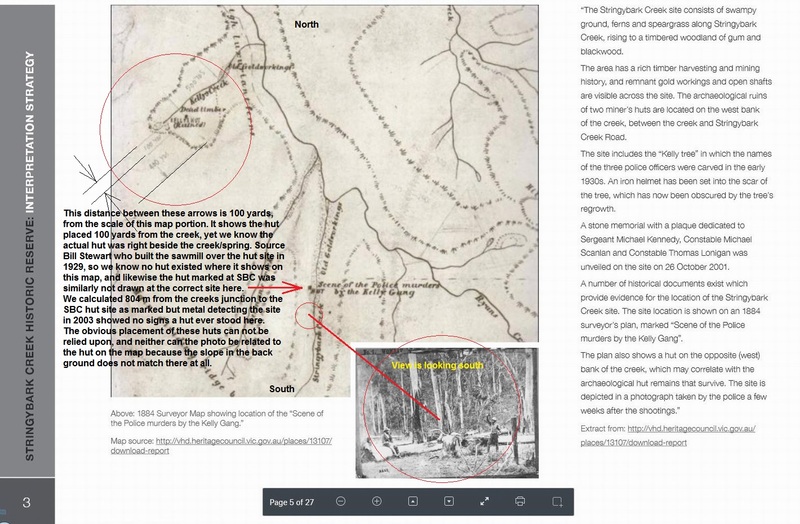 And, for the record, having visited Stringybark Creek with Bill Denheld and seen the evidence with my own eyes, I am confident that he has it right." "Section 6 states that the interpretation will focus on letting the visitor connect with and re-imagine the setting in its c.1878 garb" . Years ago someone asked me, 'why does it matter exactly where Const Lonigan was shot' ? I say, try telling someone to go over there to that Kelly tree and imagine the scene where Lonigan was shot when it did not happen there at all ! Another researcher after I had shown her the sites, "since I now know where it happened, at least I can stand there and dream knowing I'm standing in the right place". We were able to re imagine the scenario, as from where the Kelly gang emerged into the police camp, we can pin point where the constable Lonigan fell, we can see roughly where Const Scanlan was shot and the direction McIntyre took off. Only when you have seen the right place with your own eyes, can we re-imagine. I am extremely surprised that the Key photo of the police camp taken at the time is not even part of this proposal, all very strange! Stringybark Creek already has been ruined by walkways and signage that led nowhere. Now it is going to be wrecked further by a forest of new signs, and possibly entry charges. 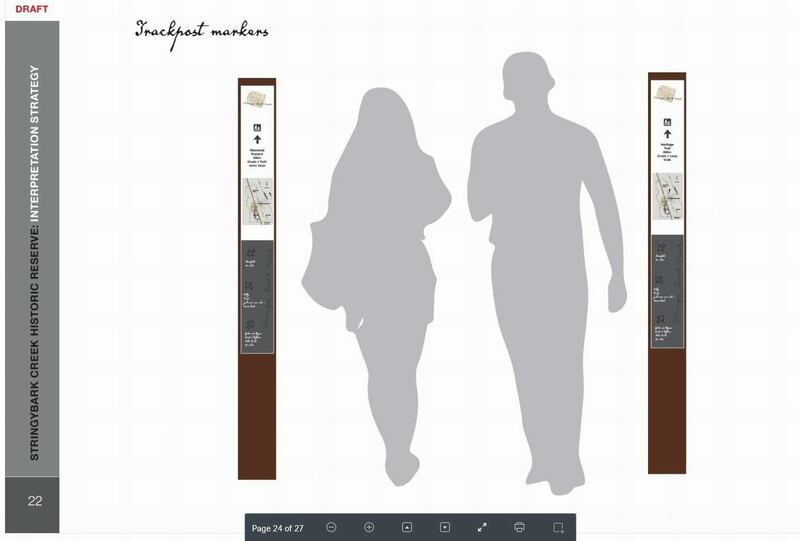 The proposed signage is mostly irrelevant waffle that includes strange concepts like 'the patina of Ned Kelly' who was a "Scarlett Pimpernel" style figure - the "Where's Wally" of the north east! There are many words, phrases and concepts that are utterly incomprehensible. Some of the arguments are so muddled they make no sense at all. Future visitors to the SBC site will need to bring a dictionary, a thesaurus and internet access to understand this signage. They will be enraged by the excessive signs, further despoiling the place. The whole experience will leave them disgusted rather than enlightened. Part of SBC's great ambience was its wilderness, now destroyed by DELWP's toilet, parking and picnic areas - and now this proposed signage wonderland. A sign pointing to Bill Denheld's Two Huts site of the police camp/murders should be erected once archaeology has been done. This is a very obvious, urgent necessity! The visitor to SBC does not need to be re educated about where stolen stock were distributed to and from. He / she is there because they have read the many commentaries and now wants to see the sites at SBC where it all happened, and not be forced to stand around reading reams of text. This place can be bitterly cold, wet and miserable, I know. The history visitor has already read the whole story. All he, his wife and kids want to see is where it happened, not some extraneous explanation of where SBC is located, they already know that. If they make it there they have either come from Mansfield or Benalla, the road is twisty and in the wet 'dangerous'. They want in the shortest time to see with their own eyes what and where it happened, they don't need to read the 1881 Royal Commission, or where stolen stock were traded. We could expand on stolen stock if we were at Bullock Creek where there is a small valley that it is said stolen stock was held. Its important this place is given over to the police side of the story. It has little to do telling otherwise. AND unless the 'actual sites' are recognised and dealt with, this WHOLE exercise is a failure. Its no use pretending it happened here or there when it did not, requiring the visitor to read all this stuff when all along they came to experience the actual place, not a pretence place. SBC is all about truth not about anything else. AND unless the actual sites are recognised, SBC will remain a travesty to all visitors as it has been since those early 1884/5 maps which have deceived all visitors. Its only in our times with access to vast volumes of material and digital means that we can now say with certainty that we know where things actually happened. Instead of spending tens of thousands on signage - graphics, writings and upgrades, shouldn't we first settle where these sites are actually located? Why not invite a large number of interested persons, photo forensic experts, archaeology students, the police history museum people, forest managers, historians and anyone interested meet at SBC. A show and tell by all parties, and then on another date attend a SBC symposium set up to unravel and evaluate all that can be presented, and filmed as we go by University Film making students. This would make a very interesting documentary and let primary sources, science and logic decide where all this signage is to go. Not just leave it up to some one organisation to cook up a pretty plan that won't wash.
Its interesting that Ian Charles quotes a snippet from an account from the 1884 Bendigo Advertiser 1884, some six years after the event at SBC. The pertinent point is this, in 1884, the writer states that the police Mansfield monument should be at SBC, yet even now there is no attempt to get it right 133 years later. (ref 1884) The Mansfield monument to the police is one thing, if there was to be a monument at SBC, then lets make sure its in the right place, otherwise why spend thousands on the wrong place as noted. 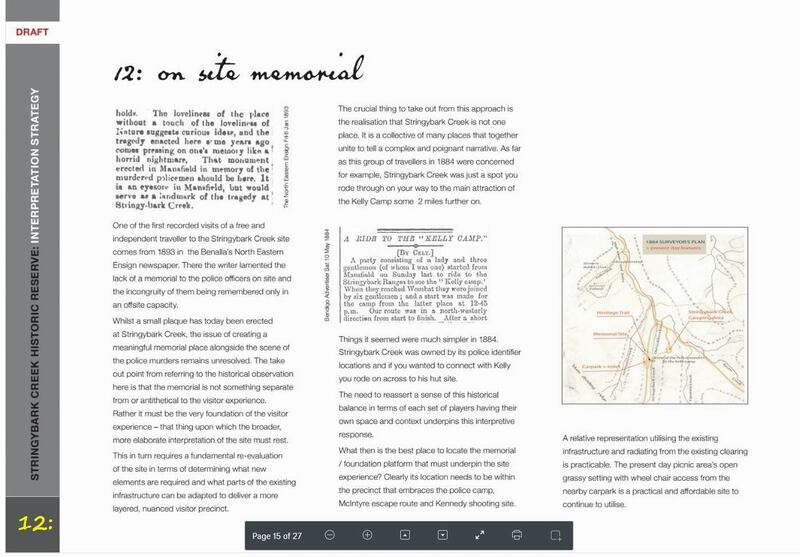 Ian Charles writes (Para 6) " What then is the best place to locate the memorial / foundation platform that must UNDERPIN the site experience? Clearly its location needs to be within the precinct that embraces the police camp." Well that's a surprise, but the present day picnic area as proposed is NOT the site 'where anything happened'. There might be a convenient picnic ground area there which might be an easy opportunity to tell the story but its certainly not good enough, not to guide and allow the visitor to see the three actual sites where the police camped and where two were killed. If this is not addressed by this process, DELWP, Heritage Vic and Police Historical Unit, have each failed the public interests and public monies being spent. As a result it will be creating an unintended unsatisfied groups that may put in place the directions to the right place out of control if the authorities don't address this better. 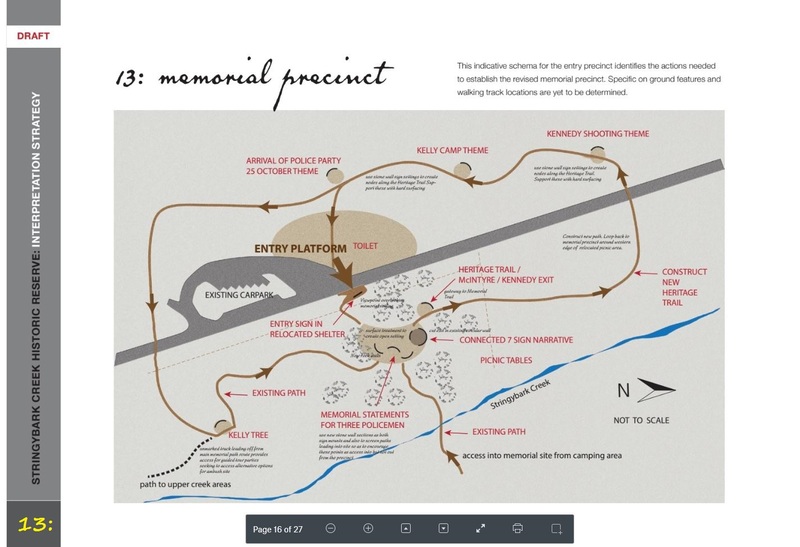 The above diagram page 'Memorial Precincts' is a joke. 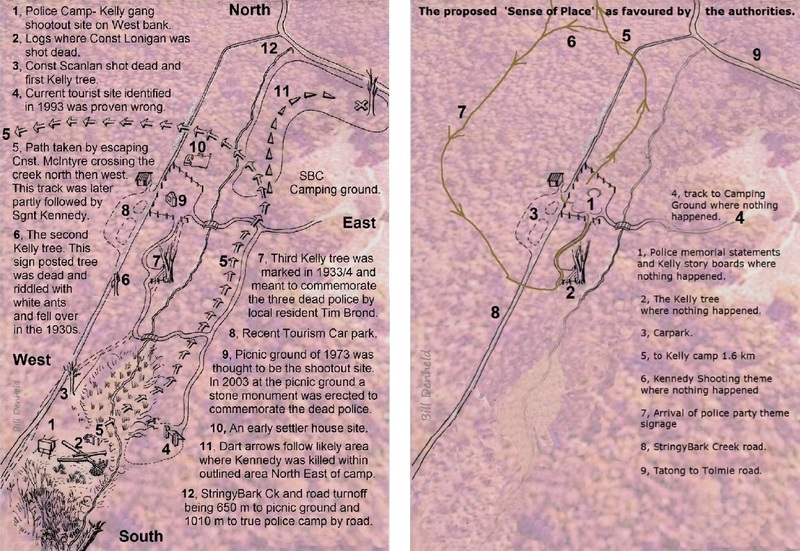 Firstly the Police camp and Kennedy sites are totally in the wrong place. They are both east side of the road, not west at all. No one coming to SBC will want to walk around a trail that won't go to the actual sites. This will be made clear on webpages like this, and few visitors will be fooled. Images below will highlight the differences. On the left is the actual layout for SBC, whereas, on right is what is proposed by Ian Charles Vic Police and for DELWP with apparent approval from Heritage Victoria. We should ask for what reason should a visitor not be able to go to the actual sites? This is not a sense of place, its a cop out fallacy. No one will endorse this 'simple schema' layout. As the text says, it's not to scale, but the trail must lead to the true places as on these Google Earth images would show. 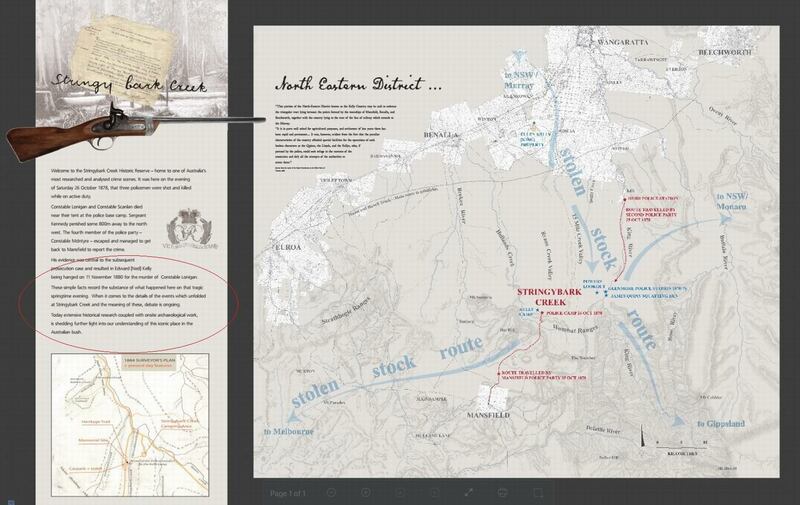 The contrast between Bill's SBC map on the left hand side and the accompanying right-hand map of the proposed trail, together with his explanations on that and the other slides, show clearly why Bill's points are vital to telling the story of SBC, and after reading his comments I urge that they be implemented. Knowing the actual locations where things happened is the whole point of going there, not to wander around aimlessly in the general area, or you might just as well be in some bit of stringybark forest in Gippsland. 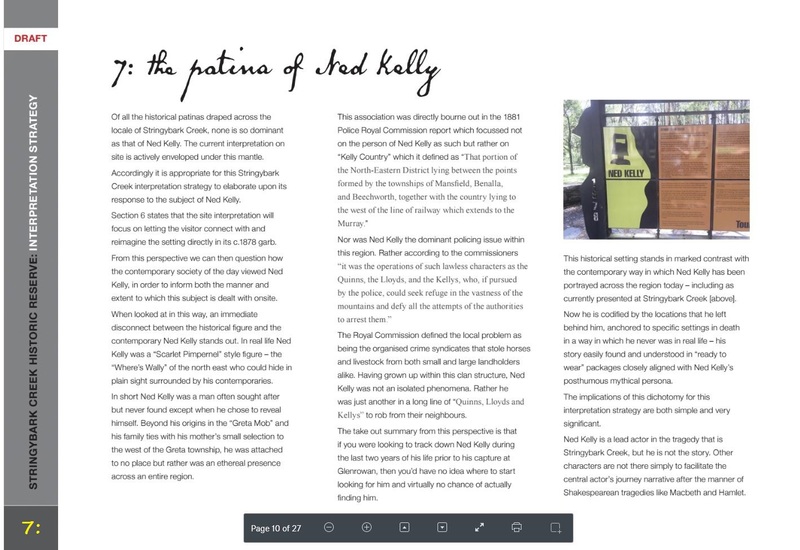 Stuart Dawson, Monash History and author, "Redeeming Fitzpatrick: Ned Kelly and the Fitzpatrick Incident", downloadable article via Google. What would be achieved with the above proposed signage updates at the picnic ground with existing picnic tables removed so very limited facilities would exist at SBC for coffee tea or lunch,a rest after a long twisty drive. Below: This is the site that fits every detail of the Burman photos and without any doubt where the police had camped. This is where the dedicated monuments to the police should be placed. This site could easily be reached via the existing east bank track from the Jones site via a walk way across the creek. Figure standing with one foot on fireplace rocks of hut 2. The slope rises to the south where a man stands to add scale to the place. Notice all the dead trees on the slope that were dumped there by DSE which have by now rotted. This picture roughly follows the red line in the image below. The Argus 28 Oct 1878 ' the police camped from Friday evening at Stringybark on an open space on a creek - the site of some old diggings - and they pitched the tent near the ruins of two huts'. McIntyre Manuscript: the "tent was pitched a few yards behind "an old hut" and faced east. Below: The site of two huts is a tranquil open place where people could pay homage and reflect on the tragedy knowing this was the place where Const Lonigan and Scanlan were shot. If this place were archaeological and forensics investigated as it deserves to be, then the picnic ground could /should be left as it is because nothing ever happened there. Above: The new road has been cut across the 'slope which curves to the creek S, East'. A newspaper reporter for the Herald 5 November 1878 wrote- "At the top of the slope (little hill) and overlooking the police tent, was a clump of scrub and sword grass - " Note he said 'overlooking the police tent' meant he was able to look down on the tent from above. This is important as there's no other place along SBC where you could describe the scene as to be looking down on the tent that way, so he must have stood somewhere near the top of this slope, near the end of that re line and looking down northerly from the south. Please Note: The slope was severally messed up in 2009 when the DSE decided to bulldoze all the dead trees from the top of the slope down hill and destroying the natural ambiance and appearance of the slope ( picture below). This was a disgrace as the DSE managers knew this slope was to be part of the archaeology that Jeremy Smith and Heritage Victoria had committed to investigate in May 2008. Comments for 22: These totem like poles stuck out in the bush are tall skinny structures that are very elegant but where do they lead if none to the actual sites are to be referenced? Image above: In this image we see portraits of the three dead police officers depicted over a very interest drawing that originated from a photograph that has been totally ignored by this proposal. The drawing was in the Australasian Sketcher only weeks after the killings and shows the details of the site where Constable Thomas Lonigan was shot. Please Take particular note of the slope rising on the left with no creek between the logs and the rising ground. The creek is to the far left of this picture. Just behind the stump with the axe, is a tree behind which is a un-natural structure which is the remains of a hut fireplace. This actual fireplace was found in Sept 2002. In the foreground centre right are the remains of another hut was stumbling across in the undergrowth. This hut site drawn showing two un burnt posts of one side, and some unburnt vertical members rising up from the ground indicating a wall that could be described as overlapping shingles. We have to remember this was drawn as an etching for print in the illustrated news paper, but in the actual photos, the fireplace behind the log is hardly noticeable. So this means the artist went to SBC and drew the scene probably with a copy of the Burman photo in hand, he sketched the best he could to capture the scenario of the place. He captured the scene perfectly even better than the photo by photographer Burman. Remember in those days it was not possible to reproduce photos in print. The fact he drew the fireplace remains of one obscured hut site, and the un burnt posts of the other, together with the slope in the background is a three way positive for where this site is located without any doubt. If this proposal were to have any credibility at all the Burman photo would be the Number one primary source for identifying the actual site of the shootings, YET why is this original photo ignored? In the foreground is a box which in the photo was the photographers photo plate box, so we know the artist had with him a copy of the Burman photo to compare his location to capture a similar view. 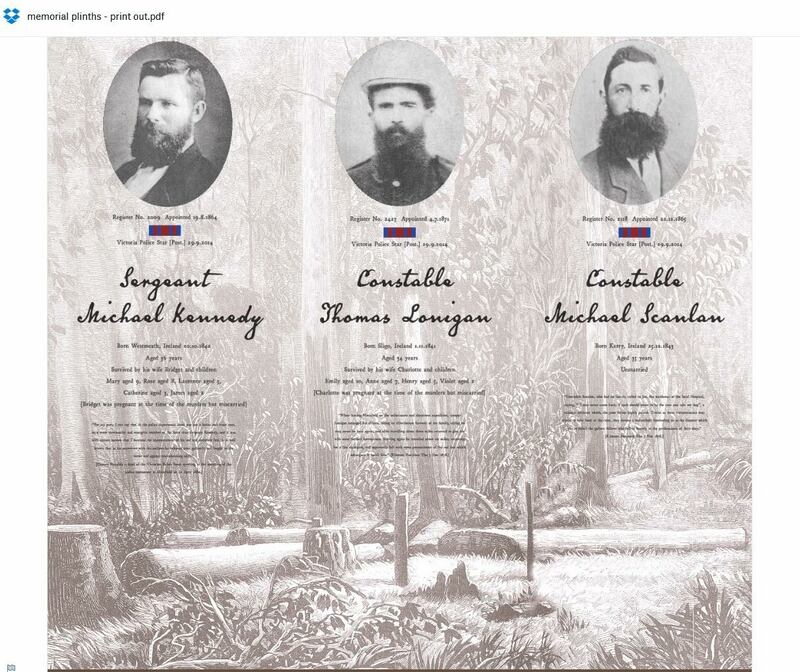 Stringybark Creek in the Toombullup (formerly Wombat) Ranges is the site where three policemen, Sergeant Michael Kennedy, and Constables Thomas Lonigan and Michael Scanlan were killed while on duty on October 26th 1878 by a group that became known as the Kelly Gang. 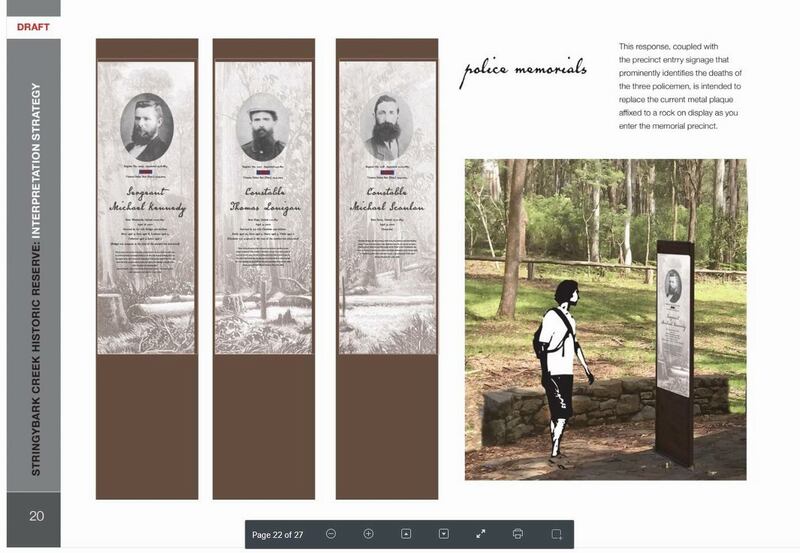 Department of Environment, Land, Water and Planning (DELWP) manages the Stringybark Creek Historic Reserve within the Toombullup Historic Area and is undertaking a project to better reflect the importance of Stingybark Creek from a historical perspective and for the families of the policemen killed there. The project includes a review and upgrade of the signage and facilities at the site. As well as the addition of a new walk in the general vicinity of where Constable McIntyre escaped and Sergeant Kennedy was killed. The project will not attempt to identify the exact site of the Police Camp on Stringybark Creek. 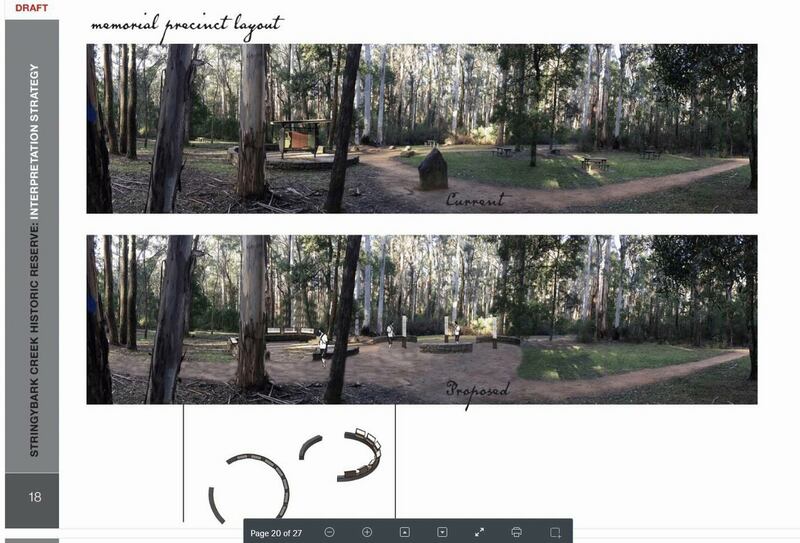 In June DELWP engaged Ian Charles of Charles Walsh Nature Tourism to develop an interpretation plan for the Stringybark Creek Historic Reserve following a tender process. For over 20 years Charles Walsh Nature Tourism has delivered innovative interpretive projects in natural areas to enrich the experience of visitors. Several of these projects required the narrative and infrastructure to be sensitive to the story being told. Of relevance was the Sergeant Parry Memorial, Sergeant Parry being killed by bushranger Johnny Gilbert in 1864. 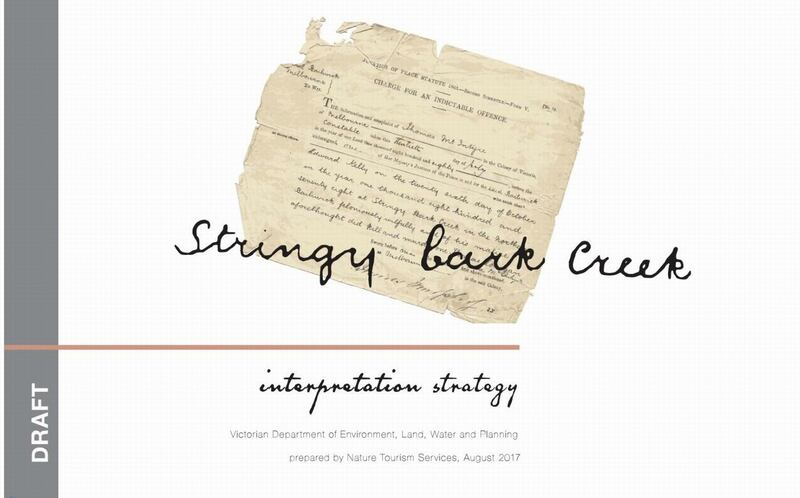 The draft interpretation strategy, proposed range of signs to tell the story at Stringybark Creek and site plan are provided for your review and feedback. The interpretation strategy provides the context for the changes proposed to the site. It outlines the approach taken and the rationale for the changes to the site and on-site interpretive material. The document includes images of the proposed signs and site plan. The proposed signs cannot be read in the interpretive strategy so links have been provided to allow each sign to be viewed. Please note, the walking track shown on the site plan is indicative only. The final alignment is yet to be determined. As stakeholders interested in this project, we are inviting you to review the strategy. Please take the time to understand the rationale as well as the sign narratives, graphics and look. We welcome feedback on the signage. Please provide your comments by email or phone to Catherine Spencer (details below) by Monday 11 September. This email contains the links to where the draft documents are stored in a Dropbox account. The documents are too large to email as attachments. Click on the links and Dropbox will open in your web browser and you can review the documents on the screen. To print the documents, click on the download button (top right) and select direct download. You can then save the documents and open them up as a pdf and print as normal. It is not possible to print directly from the Dropbox. Several stakeholders contacted me in response to our request for ideas on primary documents to include in the signs. 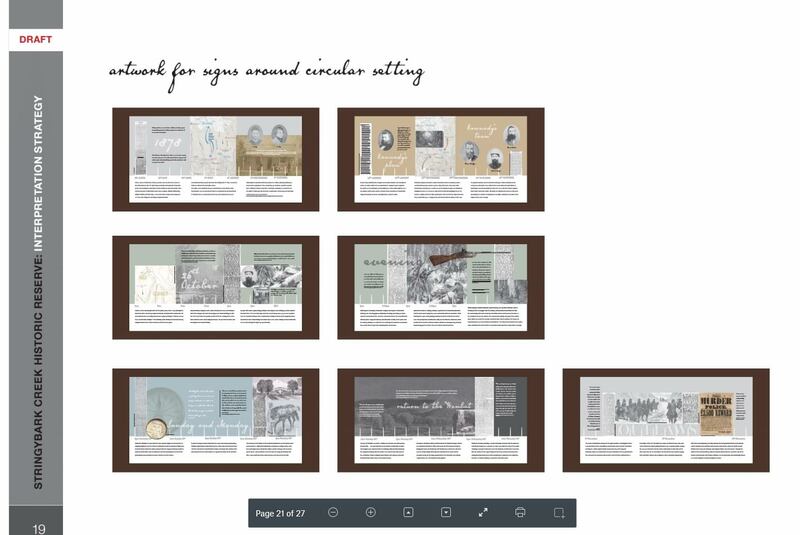 These ideas were passed on to Ian Charles as a starting point for developing the sign narrative and a number have been included or used as reference material. You have been sent this update as someone we understand is interested in the Stringybark Creek project. If you do not wish to receive future updates please outline this via return email. If you are aware of someone that may be interested in updates, please let them know about the project and how to receive further information.